Hadley is on her way to London to attend her father's wedding and everything is going wrong. She's late, ends up missing her flight, and is stuck wandering around JFK until the next flight. The only good thing is Oliver, the wonderful British boy she meets in the waiting area and who ends up being her seatmate for the seven hour flight. They talk and bond all night yet end up losing each other at the airport in London with no ways of contact. Hadley then makes her way to her father's wedding, fighting conflicting feelings of facing her new stepmother and hurt towards her father for his new life. All the while, Hadley wonders where Oliver is and if she can ever find him again. In the past six months, I've been in a lot of different airports. They've been humongous ones (Atlanta, Miami, Los Angeles) as well as foreign ones (extra scary not knowing the language). All I remember about them is A LOT of people, A LOT of madness, and feeling like I was going to lose myself in the huge crowds. Jennifer Smith accurately portrayed the crazyness of airports as well as rush and nervousness of being late and/or missing a flight. Unfortunately, I can't much relate to her her "fated flight romance" scenes, as that has yet to happen to me. I always end up next to old ladies or babies! It's hard to get a grip on the fact that this book takes place in less than 24 hours yet so much happens and so many miles are covered. It's a pretty basic and predictable story overall, but it was extremely cute and made me smile and tear up plenty of times. Highly recommended for all YA lovers or those who want a quick read while traveling! 4 stars. I would probably love this book, at the very least because I love people watching in airports...making up stories in my head about where people are going, who they are visiting etc. Sounds like a fun read! I can't wait to read this one! 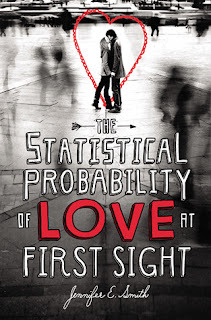 I just finished This is What Happy Looks Like last week and LOVED it so much that I had to buy The Statistical Probability of Love at First Sight. I think it'll be the perfect Spring read! I just finished reading This Is What Happy Looks Like, and I absolutely loved it, it was adorable and I loved all the characters. I have been hearing about The Statistical Probability of Love at First Sight so much that after reading the other one, I knew I would love this book as well and went out to buy. I hope I get to read this one soon! I've heard good things about this book. I'm not a fan of insta-love, but I want to read this one! Great review! I have this on my Kindle and unbelievably I still haven't read it yet! It looks really cute and I really must read it soon! I've got this one on my Kindle and it sounds like the kind of book that I would love! I mean it also sounds a little cheesy, but that's a good thing every once in awhile! Great review! I'm waiting to find love at an airport because of this book, it would be the cutest thing ever. I hope to read more books written by the same author. Great review! Happy to hear you enjoyed this one! I read it right around when it first came out and I had no idea what to expect at the time but I absolutely loved it. It's such a sweet story with lovable characters. And it would be a great book to read while travelling! Can't wait to read This is What Happy Looks Like. Great review! I agree that it's a great read, but also basic and predictable. I read it on a plane and it was perfect for that (even though I didn't meet a cute guy :/). I love the look of this! Definitely going on my to-read list. I'm collecting perfect travel books for my holiday at the end of May, and this is going for sure! Yes, this book was totally adorable. I was surprised by how much had to do with Hadley dealing with her father. Honestly, I don't know if I could have forgiven my dad if he ever did something like that. This book made me so emotional-I was expecting a much lighter story and was disappointed not to get that.